Love the cupcake bundt tin! the cris cross one in the first picture of your collage looks amazing! Fab giveaway! My favourite bundt has to be the Heritage Bundt. I love the bundt tin you used to make the Mango & Passion Fruit Cake. I want to win! I bet the cake lifter is actually really useful! I like the cake pops pan. The heart shaped Bundt tin in your pics above is lovely. I've never made Bundt, so I'd love the Bavarian one - oh but the cupcake pan is soo cute too - can't decide! The Bavaria bundt tin - classic and classy! 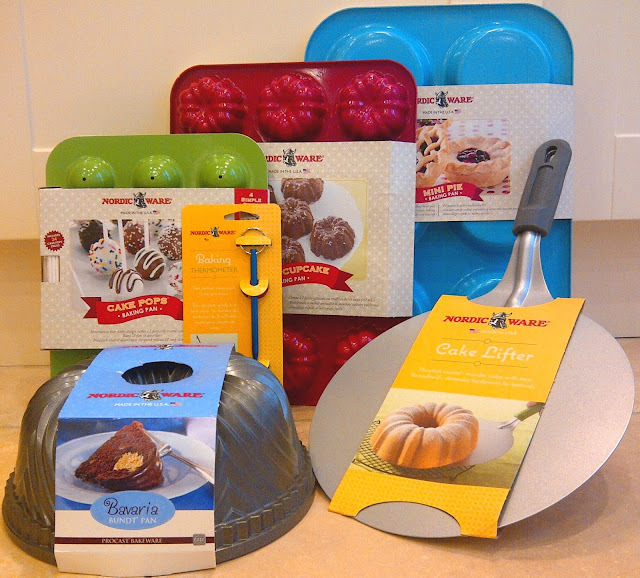 Love the Bundt Cupcake Pan. Love the colours of these pans, fab! The heritage pan would be my dream bundt tin. I love the cupcake bundt tin. The one that you used in your Elderflower and Gooseberry Bundt Cake recipe. The cupcake Bundt tin is amazing!! Love this range, particularly the Cake Pop tray. Fantastic! I could do lots more baking. All of these are droolworthy. I love the Bundt Cupcake Pan! The Bavaria Bundt cake tin - so pretty! That lovely criss cross tin right at the top of your posting. It looks fantastic! My favorite is the cup cake one. I've never used a bundt tin before. I love the look of al of your bundts, but if I have to choose one I may as well go for the Bavarian. I love the Christmas cake pan! I like the Mini Pie Pan. I love the cupcake tin! I only have one bundt tin, a quite plain round one, but I love it! I like the Platinum Cathedral Bundt Pan. I love the Bavaria bundt tin! I would love to have the bundt tin it would be great to make cakes with for my family. I love the Cake Pop Bundt Tin! The Bundt Cupcake tin looks fun to use! Would love to have some Nordic Ware bakeware! Been staring lovingly at it on Pinterest! My kids have been asking me to make Cake Pops for a while now so I think that one! I have joined as your friend. I have only just discovered your blog, as I was researching bundt cakes - OMG, so glad I found you! I have one little bundt tin that I got from Lidl and although it was cheap, it seems to be very sturdy. Making my first cake todat, eeep! I dont have any bundt tins ...love the cupcake one !!!! I'm doing all the raffle copter thingies for THE FIRST TIME! I already own the cake pops tin but would love the others. I've never made a bundt tin cake before but the cupcake one does sound good! Bavarian. No reason. Never had a bundt so wouldn't know. But it looks the biggest which is nice. Mine is the Platinum Elegant Heart Bundt Pan, Lovely. 3-D Great Pumpkin Bundt Pan would love to make one with this!